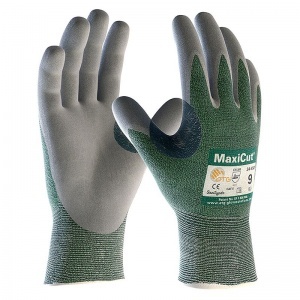 The MaxiCut Resistant Level 3 Dry Gloves (Pack of 12 Pairs) have been designed and developed as breathable cut-resistant gloves. The MaxiCut Resistant Level 3 Dry Gloves combine cut protection with comfort, offering flexibility and dexterity for dry environments. The product code for these gloves is 34-450. Through this listing, you can purchase the MaxiCut 34-450 gloves in pack quantity, getting 12 pairs of gloves at a reduced price. Ideal for the automotive and logistics industries, this bundle allows businesses of every size to save money on their essentials. To purchase these gloves in single pairs, please see the standard listing. Optimised grip - delivered through our micro-cup finish, allows for a controlled grip. Handling ceramics, corrugated sheets, non-deburred parts, glass panels, plastics injection moulds, sharp edged metal sheets, small sharp components, logistics and warehousing, maintenance and primary, secondary and final assembly.